After the re-release of the beloved X-Men Arcade Game, Konami has come around and released yet another arcade game from my childhood, The Simpsons Arcade Game. 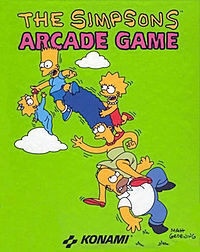 The game was released originally in 1992 and is a beat ’em up game where you play as Bart, Lisa, Homer, or Marge as they try to rescue Maggie from the evil Mr. Burns. The game was hard, at least for me, to find in any arcade, but when I did see the bright blue cabinet I knew I’d be sinking quarters into that bad boy soon enough. I’ve completed a playthrough of the game as Marge and have the videos below for you to enjoy. Great game overall, and I’m happy to see the game finally out there for the masses to enjoy.